YOU WANT TO: Pump up the volume by adding “calories” to your hair. 1. Shampoo and condition every other day. 2. Add a quarter-size dollop of volumizing mousse to roots of damp hair. 3. Blow-dry hair by lifting it up and away from the scalp to create volume. 4. Use a medium-size round brush to smooth out the ends. 5. When hair is completely dry, lift it and mist the roots with a volumizing spray to add separation and texture. YOU WANT TO: Incorporate swing and movement in to strands that would otherwise lay flat. 1. Shampoo and condition every two days. 2. Pour a dime-size dollop of blow-dry creme onto hands and distribute the product into damp hair, working it evenly from the mid-shaft all the way to the ends. 3. Blow-dry hair thoroughly with a round brush. 4. For the perfect finish, mist a light, touchable hair spray all over to achieve a soft hold. YOU WANT TO: Keep ends from looking dry by boosting shine. 2. On damp hair, apply a quarter-size amount of hair treatment oil; start on the ends and work your way up. Be sure to avoid the roots and scalp area or hair might look greasy. 3. Blow-dry hair, then follow up with a few spritzes of shine-enhancing spray for added brilliance. YOU WANT TO: Prevent your strands from falling flat on top by encouraging more fullness. 1. Shampoo and condition daily. 2. 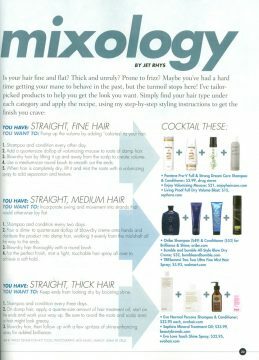 Add hair-thickening spray to the root area. 3. Spritz a generous amount of surf spray from mid-strand to ends. 4. Add a nickel-size amount of conditioning hair styling cream to soften and define your waves. 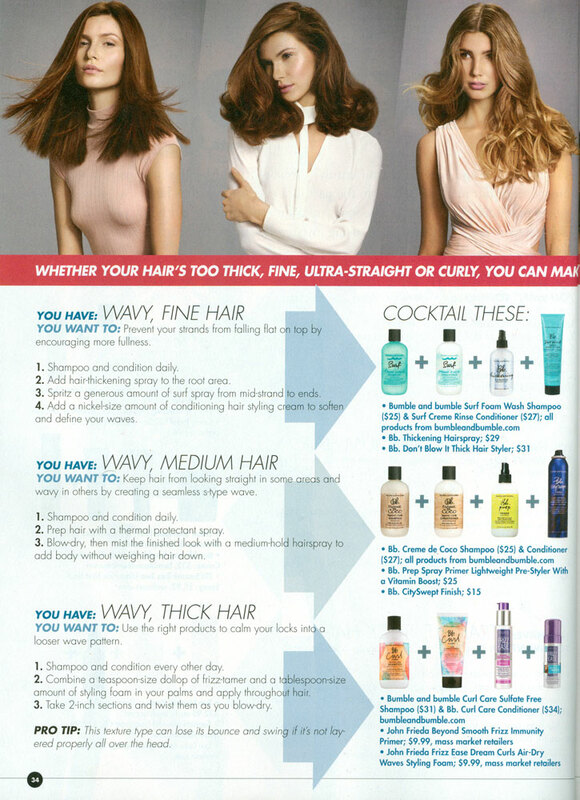 YOU WANT TO: Keep hair from looking straight in some areas and wavy in others by creating a seamless s-type wave. 2. Prep hair with a thermal protectant spray. 3. Blow-dry, then mist the finished look with a medium-hold hairspray to add body without weighing hair down. YOU WANT TO: Use the right products to calm your locks into a looser wave pattern. 2. Combine a teaspoon-size dollop of frizz-tamer and a tablespoon-size amount of styling foam in your palms and apply throughout hair. 3. Take 2-inch sections and twist them as you blow-dry. PRO TIP: This texture type can lose its bounce and swing if it’s not layered properly all over the head. YOU WANT TO: Give texture a boost so it appears fuller. 2. Mist a volumizing spray at the roots. 3. Add a quarter-size dollop of volumizing foam to tips of hair. 4. As you blow-dry, lift the root area gently with fingers to add volume and hold, then scrunch ends with a diffuser until hair is 75-percent dry. YOU WANT TO: Diminish frizz on the hair’s outermost layer. 3. Apply a moisturizing gel from roots to tips and comb evenly throughout. 4. Blow-dry, scrunching hair with your fingers. YOU WANT TO: Keep ends from looking dry by upping the shine. 2. Combine a generous amount of defining gel and 4 to 5 drops of frizz tamer in the palm of your hand, rub hands together and apply throughout hair. 3. Let hair dry by itself to keep frizz and flyaways at bay. PRO TIP: Use a conditioning mask once a week to hydrate thick locks. 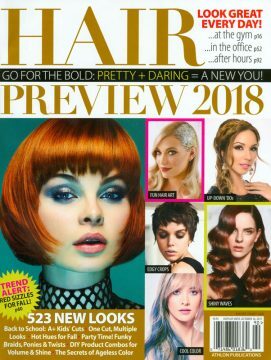 Jet Rhys teaches cut, color and styling techniques on international stages and styles A-list celebrities for Hollywood events.